Goldman Explains How "Bitcoin Could Succeed As A Form Of Money"
Yes, we all know the recurring complaints: it's volatile, it's new and untested, it can be hacked, and it has no central bank backing it; most established pundits hate it - today's comments by Warren Buffett a case in point - and as Goldman writes in a note released today by its economic team, "cryptocurrencies can seem like a solution in search of a problem." Specifically, Goldman notes that "money derives its value from its usefulness in facilitating transactions and diversifying portfolios. The US Dollar serves both purposes relatively well—or at least better than the main alternatives—so it is in high demand around the world." Then again, the real reason why Goldman is unable to grasp the utility of Bitcoin, is that the bank - like so many of its peers - is unwilling and unable to admit that there is a problem which bitcoin is addressing, a problem which as Deutsche Bank's Jim Reid and Macquarie's Viktor Shvets explained back in September, is that "Modern Finance, Not Bitcoin, Is The Real Fraud." And yet, even without admitting that the entire financial system is a giant "fraud" based on ever rising leverage, one which the central banks have spent tens of trillions in the past decade to prop up, Goldman is willing to suggest that there is a "case for crypto" and that even in a world where the dollar is supposedly a much better currency, if one without central bank backing, bitcoin "could succeed as a form of money." Here's why Goldman is not ready to fully close the book on bitcoin and crypto. In practice, Bitcoin and other digital currencies face significant practical hurdles to their adoption as outside forms of money, and many of their possible benefits come with significant drawbacks—several of which were highlighted by our colleagues in an earlier report (Top of Mind: All about Bitcoin, March 11, 2014). First, some features of cryptocurrencies that might make them competitive with alternative stores of value are also features that are likely to attract government scrutiny. In particular, the anonymity of many cryptocurrencies makes them a useful medium of exchange for criminal activities, including tax avoidance and the circumvention of capital controls. As such, it would be surprising if continued growth in their popularity did not eventually attract greater regulation and law enforcement action by government. Second, the fact that cryptocurrencies function without central banks may make them valuable as inflation hedges or stores of value, but also makes them vulnerable to demand-driven fluctuations in price. Such volatility makes them poorly suited as a substitute for money generally—which is why most nations eventually abandoned the gold standard in favor of fiat currencies that can more easily stabilize the purchasing power of money by making the necessary supply adjustments in response to changes in money demand. The recent fluctuations in Bitcoin and its relatives suggest they are much too volatile to serve as money (Exhibit 5). 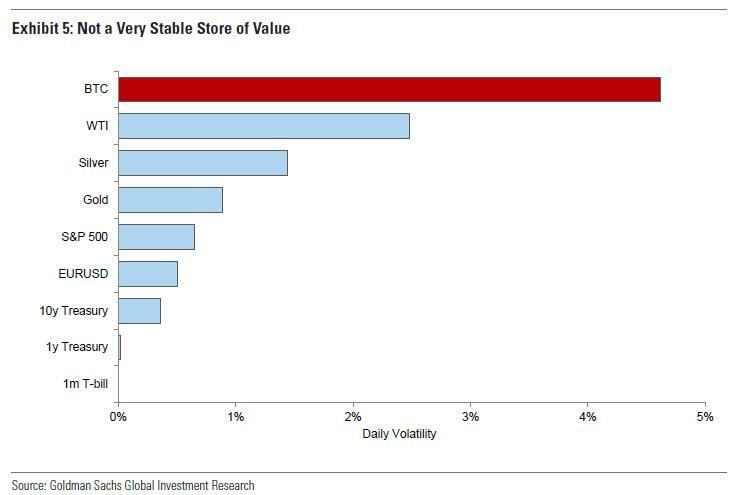 Volatility would likely need to come down dramatically (either naturally or through the widespread adoption of cryptocurrencies designed to better stabilize purchasing power via supply adjustments) before we see broader adoption. We should also stress that, as money, cryptocurrencies should have low expectedreturns in the long run, despite their high returns recently. Our working assumption is that long-run cryptocurrency returns should be equal to (or slightly below) growth in global real output—a number in the low single digits. Thus, digital currencies should be thought of as low/zero return or hedge-like assets, akin to gold or certain other metals. This could still mean that prices increase at a faster rate as the technology is adopted—an analogy might be the value of a biotech company that invents a drug, which eventually becomes a generic—but there is an inherent contradiction between cryptocurrencies as high return assets on the one hand, and stores of value relative to goods and services on the other. So could Bitcoin succeed as a form of money? In theory, yes, if it proves to be more useful than the alternatives—in terms of facilitating transactions at a lower cost and/or providing better risk-adjusted returns for portfolios. In practice, however, these gains look small, at least in developed market economies. Transaction costs are relatively low, exchange rates and price inflation are broadly stable, precious metals can be used for portfolio diversification, and governments place few restrictions on holding foreign currency or foreign assets. That said, the widespread use of the Dollar outside the US—and full Dollarization in some countries—suggests there is already demand for an internationally accepted medium of exchange and store of value. In those countries and corners of the financial system where the traditional services of money are inadequately supplied, Bitcoin (and cryptocurrencies more generally) may offer viable alternatives. Well if Goldman indeed believes that cryptos could succeed as a form of money, we are confident it could price out the probability and vol, and take the other side of the "5 year put on every cryptocurrency" that Buffett would like to buy.